The project MSX Sketch Tools aims at providing conversion tools between MSX black & white image editors and PC GIF format, such as the brazilian Graphos III, Aquarela and Page-Maker and the dutch Dynamic Publisher. Some MSX graphic editors make use of B&W images that looks like those hand-made sketches. But what is a B&W image? Generally speaking, there is a certain confusion about the concept of B&W images. In digital images, a gray-level image is the one that has several levels of gray color between the black and white colors, where each gray level has the RGB components with the same value. In such way, we represent a RGB value using only one value instead of three. On PCs, the 24-bit format images allows 256 gray levels, ranging from 0 to 255. So, if a gray-level value is 120, means that the red is 120, the green is 120 and the blue is 120. Nevertheless, the B&W image format has only two colors: the black and the white. On the MSX, the black color is represented by the color 1 and the white color is represented by the color 15. According to that, PC images must be converted to B&W format before converting to MSX B&W editors. Graphos III was developed by Renato Degiovani, and probably the best MSX 1 graphic editor ever created. This editor brings interesting tools and it is also compatible with color images. Thus, it has specific tools for working with B&W images such as the famous shapes. Shape (.shp) - The shape file is a screen 2 clip area, having 4 different formats. Although dealing with colored shapes (type 2 and 4), the most used are the B&W. Minimum size of 8x8 and maximum of 240x176. Layout (.lay) - Screen file, where only the pattern table (ink) is compressed and saved. Compac (.vdc) e (.atc) - Screen files, where both pattern (ink) and color (paper) tables are compressed and saved in two files. Display (.scr) - Screen file, where both pattern (ink) and color (paper) tables are compressed into a single file. In addiction, a load animation (display) is introduced. Fonts (.alf) - MSX character map. The project MSX Font Editor works with ".alf" files. Created by a brazilian company Nemesis, aims at newspapers and posters developing in B&W format. Works like Dynamic Publisher, and many file formats are compatible with Graphos III. Shape (.shp) - Same as Graphos III format. PC shape (.sdr) e (.shp) - PC shapes from Print Master. Layout (.lay) - Same as Graphos III format. Display (.scr) - Same as Graphos III format. Alfabeto (.alf) - Same as Graphos III format. Dump Screen 2 (.grp) - File with both screen 2 pattern and color tables. Page-Maker (*.PM?) - 4 maps with screen 2 pattern table stacked vertically. Each PM file has the dimensions of 512x192 pixels. The whole image has 512x768 pixels. Developed by Paulisoft, it was an alternative for Graphos III in Brazil. The interesting stuff is the 16x16 font. Font (.fnt) - 16x16 pixels fonts file. Sprites (.spr) - 32 monocromathic 16x16 pixels pictures. Pattern (.prd) - 16 monocromathic 8x8 pixels pictures for filling. A MSX 2 desktop publishing program developed by the dutch company Radarsoft in 1987. Probably the best desktop publishing editor for MSX. Dynamic Publisher Screen (.pct) - Dynamic Publisher screen file, having 512x704 pixels. Dynamic Publisher Font (.fnt) - 16x20 fonts file. Obs: click on the format links to read more about them. The main MSX Sketch Tools is a graphic tool that it is possible to convert images using both MSX images and PC GIFs. The supported files are: screen (.GRP), layout (.LAY), shapes (.SHP), PC shapes (.SHP) and Dynamic Publisher shapes (.STP). MSX Sketch Tools - Publisher was designed for working with desktop publishing programs such Page-Maker and Dynamic Publisher. There are 5 Java programs that runs from O.S. command line. The supported files are: Page-Maker (.PM? ), Dynamic Publisher (.PCT) and Dynamic Publisher fonts (.FNT). 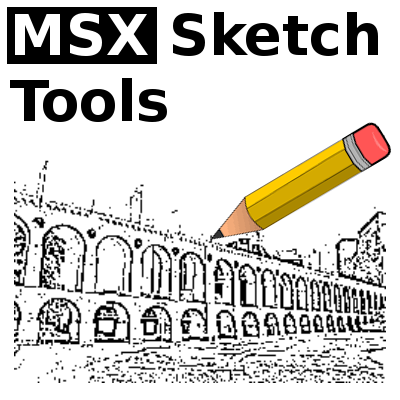 MSX Sketch Tools - Aquarela converts Aquarela files. There are 2 Java programs that runs from O.S. command line. The supported files are: Aquarela fonts (.FNT), sprites (.SPR) and pattern (.PRD). All the packages include a "readme.txt" file with some instructions on how to use the programs included in that package. exemplos.zip - Graphos III shapes, Page-Maker and Dynamic Publisher pages. gifs.zip - B&W GIF images ready to be converted to MSX. shapes.zip - A lot of shapes examples. License: GNU-GPL v. 3.x - http://www.gnu.org/licenses/gpl-3.0.txt.